The Haibane, enigmatic youths with halos and flightless, grey-feathered wings, live in a sleepy town surrounded by impenetrable walls - only the crows may come and go. Reki, an older Haibane, discovers a new cocoon, from which Rakka emerges possessing no memories except that of her dream of falling. Questions of her existence cloud Rakka's mind as she struggles to learn the ways of the Haibane and to help Reki escape the Circle of Sin. Special Features: Next Episode Previews, Creator Interview, Hane Haeterun, Special Ending, TV Commercials, New Program Commercial, Promotional Trailer, Textless Opening Song, Textless Closing Song, Trailers. This is a great anime and I'm really happy to finally add it to my collection. There's a lot I could say about this show, but I think it's best if everyone checks it out for themselves. A beautiful and mysterious anime. Subtle and character driven, it will leave a lasting impression. It doesn't answer all your questions but then that is the nature of an enigma. out you are gently asked to leave. 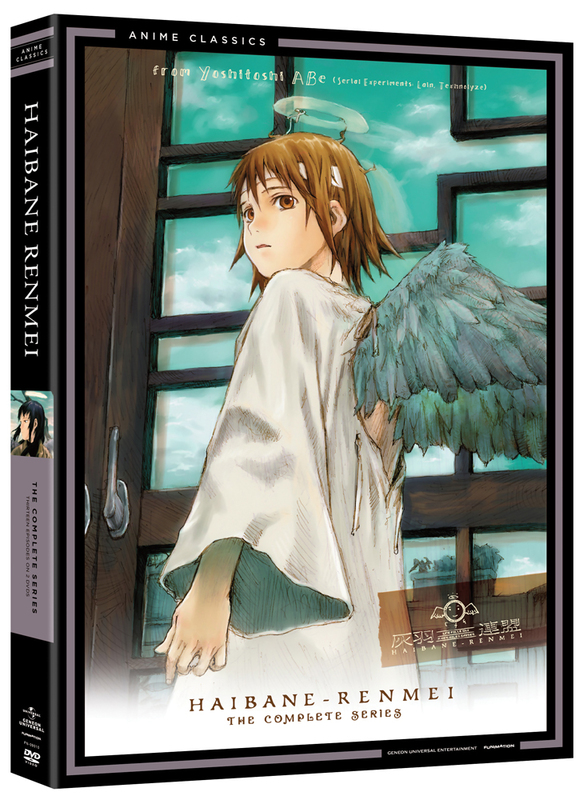 Haibane Renmei is my all-time favorite anime and was what started me in watching more dramatic anime regularly. This series may start a bit slow, but grows into a rich and meaningful story. It starts as one new "soul" joins other flightless angels in Old Home and she gets accustomed to the daily activities in a new world. It gradually grows into an allegory about sin and doubt, meaningful friendship and selflessness, purgatory and redemption. The relationships between characters in Haibane Renmei are both touching and deep, and lead to interesting conflicts and challenges. The climax of the series is moving and brought a tear to my eye. This anime has much symbolism in it, and my one fear is that viewers may not search for the deeper meaning within. If you've not watched it, give it your full attention. If you've watched it, see it again. I still hope that a sequel to this classic series may some day appear. I loved this anime the art, the characters and the tragic story. This anime may have angel like beings but be warned this story is not a happy one, though the ending may have a brighter side. Haibane Renmei does have spiritual undertones and themes of redemption, though even non-religious people like me can enjoy it. I give this anime an 7/10. I went into this show completely blind, only barely remembering the first 3 episodes when I rented it years ago at Blockbuster lol. But man, this show is great! It's a nice slow burn kind of series. I don't want to spoil it but all I can say is it's a wonderful series! This nice quality box comes /with/ the DVDs! If you liked Lain, then yay, this is by the same artist. However, it’s a very different vibe. Lain is a cerebral about technology and Haibane is about self worth. There’s not really a good way to talk about the actual anime without giving away all the spoilers. So in the vaguest sense: falling, egg, ouchie, wings!!! halo! Feelings! Birb! Feelings! Birb! Feeling feeling feelings, oh goodnesss 😧 oooh, neato!! Train death doom, feelings! Egg! But the actual product that you’ve clicked on is quite nice. The glossy box houses the dvd cases perfectly, and very much like a box. It’s a nice box. Best part, the DVD’s come with the box, so you can enjoy the show as well as the box.